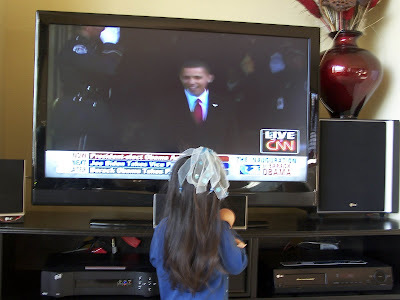 This morning the kids got up and were all excited to see the activities on the television towards the Presidents inauguration. It truly is a great moment in the history of not just the United States but the world around us. So many people have waited so long to see a black man step into power like this and lead us into a better future. It was not long ago that a black person in this country could not be seated in a bus anywhere they chose or walk into a restaurant and get equal service and TODAY we had the opportunity to witness PRESIDENT BARACK OBAMA reach the highest power and swear his presidential oath of office.This brings the hopes of more jobs and better security and most importantly to end the war and bring home the troops. 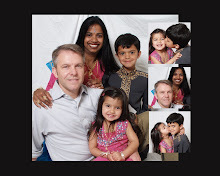 His goal to bring home all the dads and moms back to the responsibilities they abandoned to serve this country will be a blessed,joyous and proud moment that so many long to see. President Barack Obama is going to be a very different kind of leader.He and Michele will be working right along side each and everyone of us in shaping the future and making it a better place not just here in America but all around the world. I was very happy to see that he is much more down to earth and not inaccessible as most important people seem to be. Walking down the street after being sworn in when security advised against it was brave but to him it was am important thing to do. His need to be up close and personal the way he chooses is very admirable. This country is in good hand and BIG CHANGE IS COMING !!!!!!!!!! 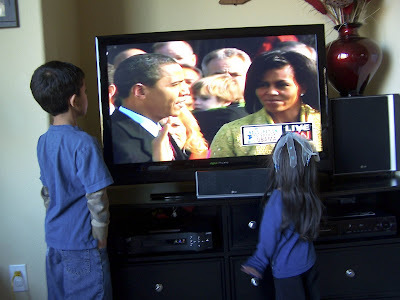 I know that today was a remarkable day in history and having my kids be a part of it all is amazing. 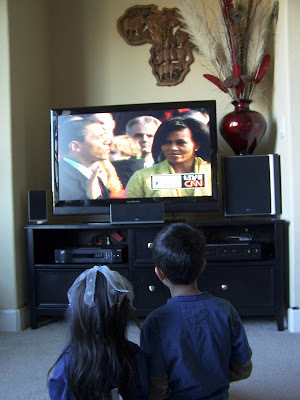 We could not travel to Washington for many reasons and watching it on CNN.com was nowhere nearly as exciting as being one of the two million braving the low temperatures so the next best thing was the comfort of my own living room. 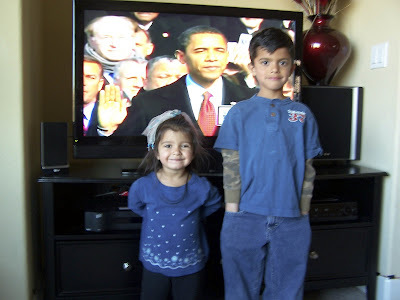 I just could not resist and had to take pics of the kids in front of the TV screen. 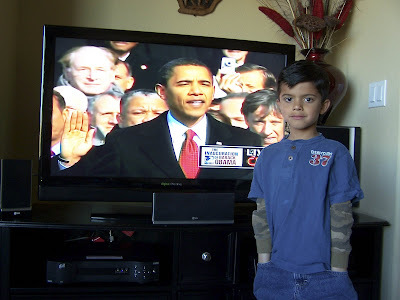 Pravan embraces technology with two arms and asked that I record the show as he had to leave for school. 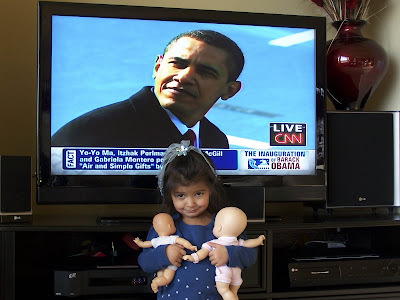 I did and Priyasha and I watched it again with him when he got home from school. We are all about to witness many important changes to come and with his guidance we will make this a better, stonger country and world just once step at a time. Thanks for taking the time to read this. http://www.haveitscrapped.com is the link for the photochallenge...sorry about the delay getting it to you...things have been crazy here. 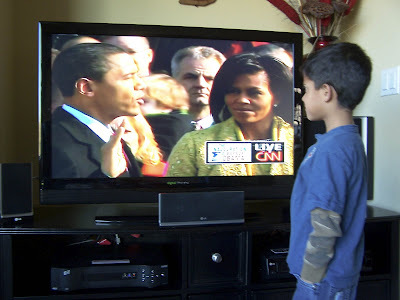 I had my son stand in front of the TV when Obama was getting sworn in so I could preserve how he looked when that happened.